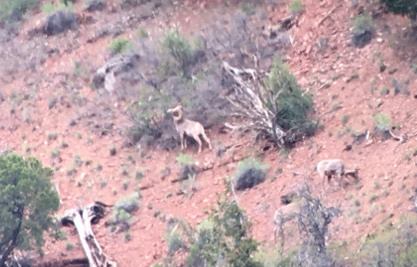 In addition to Part 1, covering the deer and elk draw for our wilderness hunts, I am putting out this 2018 Bighorn Sheep Draw Guide and a 2018 Mountain Goat Draw Guide. This article covers all the sheep units that I am familiar with and/or have guided in over the past couple years. If you don’t see a unit discussed, it’s because I don’t feel I have any valuable insight. You can apply online starting March 1st. If you are interested in booking a hunt with us, visit our sheep/goat hunt page. This unit is close to my home, and I spend a lot of time in the Western drainages that hold the sheep. The unit overlaps with the G6 goat unit. S2 is frustrating to a lot of hunters, because the sheep density is low in unforgiving country. There are only a couple small bands of sheep in the unit, so folks can waste weeks in areas without any rams worth shooting. The unit just reopened in 2016. I would have expected a nice ram to have been harvested after the unit had a hunting sabbatical, but the non-guided hunter harvested an immature 2 year-old. Location – North of Hwy 70, Vail. Sheep bordering Eagles Nest Wilderness. Limitation of hunting within ½ mi of Hwy 70 may be trickier than most people assume. Scouting for sheep movement will be key. Type – Decent access. Steep country if you don’t want to concentrate on the lower sheep or if the better rams move up. Quality – Given few rams have been taken over the past decade, there should be a high quality ram available for the tag holder somewhere in the unit. Heavy scouting to find older age class rams. 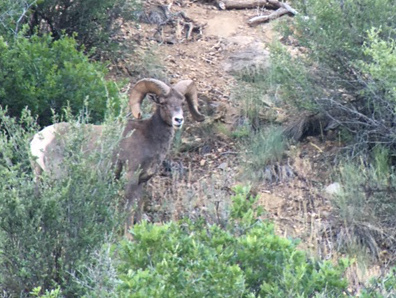 A governors tag ram was taken late in the season several years back. A very nice ram has been MIA for a couple years. Success Rate – Short history since it reopened. Historically this unit has been hit or miss, year-to-year. Draw – This is a fairly valued draw for the right type of hunter, one ready physically for the Gore Range. For a hunter that won’t be in mountain shape, this isn’t the unit. 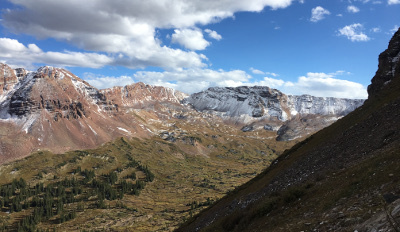 S11 takes in parts of the Collegiate Peaks Wilderness and hits Independence Pass on its Northern border. Stunning area with a mix of road-less hunting area and road access. This is one of the better units along the Hwy 24 corridor. Quality – There are older age class rams in this unit, but not like it once was. Several different pockets of sheep. The more accessible bands are pretty picked through. 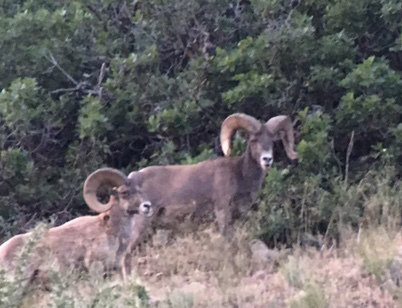 Success Rate – High success rate hunt, but still not easy to find a big, mature ram. Frustrated hunters tend to end up harvesting young sheep. Draw – I view this as a good value draw, roughly 2x easier to draw than S2. The hunting here is better than S2, with a much denser sheep population. The biggest downside is that 6 ram tags can make the hunting competitive. Accessible mid to older age-class rams will get harvested quickly. Across Hwy 24 from S11, S12 covers from the Arkansas River up to the Buffalo Peaks Wilderness area. Great early archery season in August. I can dedicate a large portion of August to helping a guided archer kill the largest ram in the unit. This unit has one of the largest populations of sheep in Colorado. Quality – There are older age class rams in this unit. Bands move to tough terrain due to intense archery hunting pressure early in August. Success Rate – High success rate hunt, but still not a slam dunk on mature rams by any means. The river sheep are hit or miss, but as a general rule rifle hunters need to be ready to go wherever the sheep go. Draw – This hunt is slightly overvalued in the draw for a resident, way overvalued for a nonresident. It is roughly 2-3x as difficult to draw as S11 on rifle tags, but does have the opportunity to hunt a larger population of sheep and some bigger rams. On the archery front, this hunt is valued about right vs S44, an easier-to-draw but more difficult hunt. This herd has been dwindling over the past two decades. There are still decent rams in the unit. Hunters better have their big boy pants on for this hunt. Be open to backpacks and camping at high elevations if you want to harvest a good ram. Location – East Maroon Bells. Boundary of unit changed in 2016. Type – High and steep. Highly dependent on scouting to harvest a decent ram. Quality – Slammer ram taken in 2014. Not a huge sheep population or historically a consistent producer of monster rams. Young ram taken in 2016. Success Rate – Dependent on hunter’s physical/mental preparedness. There is one road accessible area that you have a chance of catching sheep in. Outside of that, this is a back-country backpack deal. Draw – The closest comparison is going to be S2, low sheep population in rugged country. At roughly 2x better odds, this unit is a better draw value. Hard to compare to a S11 or S12 because the population dynamics are much different. If you are looking at a true back-country experience, this is the unit where you are competing against your own limitations, not other ram hunters. South of S11, contrary to what CPW claims, the sheep population in S17 has declined in recent years and quality is not near as good as it once was. The accessible historical harvest areas are void of anything worth shooting, so you need to be ready to hunt the harder to access areas. Quality – Expect to work very hard to kill a representative ram. Success Rate – Historical success rate by non-guided hunters is abysmal. From 2014-2016, non-guided hunters harvested zero rams while guided hunters harvested 3 rams averaging around 155-160″. East of Basalt up the Frying Pan drainage. This is a cool unit, one of my favorites. However, contact me early if you would like me to guide you here. The district ranger office is tough to deal with, and I can’t guide it until I have a temporary special use permit for the specific hunt. That can be a long process. Unlike most of the other units, the vegetation here is dense from pinyon/juniper up to thick dark timber. Quality – Fantastic quality. Governors raffle tag harvested out of this unit in 2016. Lots of mature rams. Success Rate – Archery success is low, mainly due to the terrain. Rifle success has been great, but I know some of the recent rifle hunters and they are mostly a bunch of assassins. Draw – For archers at the very top of their game, this is the best value tag of the bunch. Archer success rate has been historically low, but this unit has many quality rams. The terrain is just unforgiving to guys that are not meticulous about how they hunt here with a bow. The one downside is having to deal with 5 archery tags in a relatively small area of sheep concentration. For rifle hunters, again this is one of the best overall values of the bunch. It doesn’t feel like a great rifle sheep area because the terrain is so tight, but the access to big rams is there. Unit S47 is very comparable to S11 and S17 on the density and quality front, but is more forgiving in terms of a hunter’s physical requirements. Quality – Representative quality. 150-170″ expectation. Success Rate – Success rate varies as the sheep do move around the unit. If rams end up closer to the Arkansas River, success rate ticks up. Draw – For a hunter that is concerned about physical limitations but also wants to have a decent chance at drawing a tag sometime soon, this is a great value in the draw. Draw odds are going to fall somewhere in between S17 and S11. This unit is my home turf. My crew and I spend more time here than anyone. The sheep are low density, but there are a couple mature rams to be hunted. The terrain is not intense, but you do need to be open to a back-country style hunt. The better quality is in the road-less wilderness. Unlike a lot of the other sheep units, this topography is good horse country. If you want to kill the biggest ram in the unit, give us a call. Type – Unsuccessful hunters in the past have underestimated the remoteness of this area. This hunt is a tough backpack hunt. Horses are typically a valuable asset. Glassing spots are few and far between. The sheep vanish in this unit if you don’t know where to look. More than any other unit, historical harvest sites are of little value. Quality – Decent sized rams are attainable, there no slammers in the unit right now. Expectation should be a representative mature ram. Success Rate – Guided hunters should not have an issue harvesting a sheep, but you need to be open to a true wilderness hunt. Unfortunately, some hunters have taken young sheep over the last few years. Draw- In 2018, with only resident tags, this tag will be fairly valued for resident hunters. It is going to draw with odds similar to a unit like S11. S11 has more sheep but also 3x the pressure from other ram hunters. West of Leadville, this is a big mountain unit but it does have decent access to most of the sheep areas. In 2016, hunters did really well and pulled a lot of quality out of the unit. However, there are still some nice rams here. Success Rate – This unit has decent success rate, but it varies year-to-year. These sheep move around some, so scouting pays off. Draw- I view this hunt as comparable to the S11 hunt in terms of quality, access, sheep numbers, etc… Hence, with slightly better odds for residents and way better odds for nonresidents, I view this as one of the top values out there. This is a great hunt, but you pay for it in the draw. I keep tabs on these rams as they are near my home. A group of sheep, including a couple decent rams, were killed by a semi-truck earlier this year. Even given that incident, the area holds a lot of quality for one annual tag holder. Type – Located next to our primary outfitting area. Some of the sheep are highly visible from I-70, part of the year. Nasty, nasty terrain in the areas more prone to having shooting opportunities. DIY hunters should make a concerted effort to know where they are at all times, and recognize there is a lot of other human activity in the area. Quality – There are big rams in this unit, 170”+ ram should be the goal. Success Rate – High success rate hunt. Scouting mandatory to figure out bigger sheep and how the sheep move. Draw – Over-valued, but what are you going to say? Big sheep, right off the road. Email me directly at cliff@FTGuides.com with any questions. Enjoy Our Posts? Subscribe to get them hot of the press. 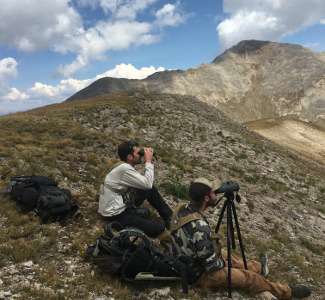 Cliff is a registered outfitter in the State of Colorado, guiding and outfitting over 100 hunters a year for elk, bighorns, goats, bears and mule deer across wilderness areas in Colorado and British Columbia. He has years of experience hunting big game via remote backpacking and horse/mule packing. Cliff is a private pilot, certified wilderness first responder, and an official measurer for both Boone & Crockett and Pope & Young records programs. Starting March of 2018, all new content not directly related to our Flat Tops Wilderness Bear/Deer/Elk hunts will be published on our TrueHunts.com website. Thinking about joining us in 2015? Let us know! Booking Update.